It’s more about winning by not losing in Bear markets than winning in Bull markets. The approach tends to generate higher returns and lower maximum drawdowns than Buy-and-Hold when a Bear is in the study period. The approach tends to underperform Buy-and-Hold in study periods that do not include Bear markets. The approach with a single risk asset versus T-Bills tends to be more tax efficient in regular accounts than selecting the highest momentum of several risk assets or T-Bills due to longer in-market periods with more long-term taxable gains. The approach is better suited to tax-deferred accounts than regular taxable accounts. Questions continue to come in about systematic approaches to tactical allocation portfolio changes – methods not based on biases, media frenzy, forecasts, chart patterns, valuation or fundamentals. Probably the simplest approach, and one that is about as objective and non-judgmental as systems can be, is to hold those risk assets that are doing best, unless none of them are doing better than T-Bills; in which case hold T-Bills until the risk assets start doing better than T-Bills. 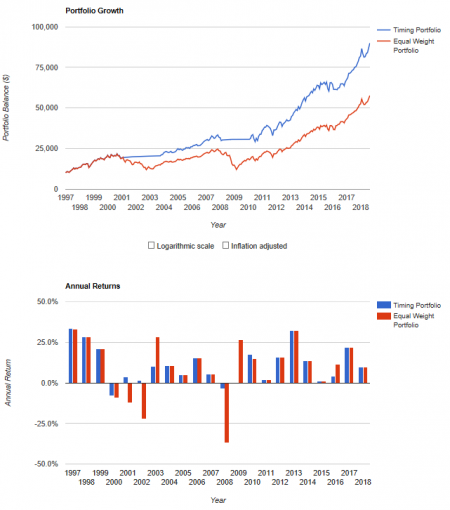 The most reliable aspect and driver of returns of the approach is minimizing major drawdowns, as shown by the flat lines in the blue timing portfolio when the red benchmark portfolio experienced major drawdowns. Secondarily, the approach may increase total return. 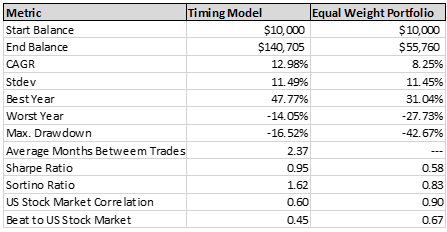 However, each trade triggers a tax event, so only those cases where the average holding time between trades is over 1 year avoid ordinary income taxes on the trades; and those that have the longest position hold times benefit most by compound growth. The approach can be used in an outright decision to hold risk assets or risk-free T-Bills (or other “cash”), or it can be used for guidance in a strategic allocation portfolio to make overweight and underweight decisions. The approach is not tax efficient for regular taxable accounts, but in some cases the outperformance may be worth the tax cost. Trading systems such as this are best used in tax-deferred accounts. Relative and absolute momentum can be done at an extremely simple level, such as rotating between one specific risk asset and T-Bills (e.g. the S&P 500 and T-Bills). That method could be used in layers, with more than one pair of two assets (e.g. S&P 500 and T-Bills as one pair, and emerging markets stocks and T-Bills as another). It is also possible with the method to choose one or more risk assets within a larger group of risk assets or T-Bills (e.g. 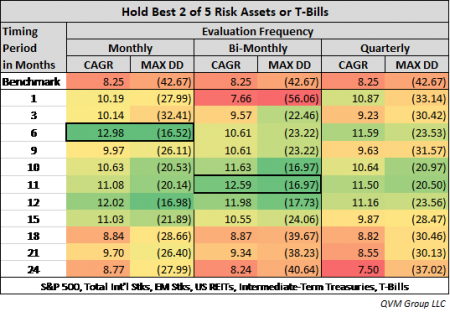 the two strongest momentum risk assets out of five or T-Bills). Working with simple pairs of one risk asset versus T-Bills is more likely to create longer position hold times, and therefore be more tax efficient for regular taxable accounts than alternating between risk assets or T-Bills. Alternating between risk assets creates more frequent trades and would be more suitable for in tax deferred accounts. The method helps avoid the severity of Bear markets, but it also needs Bears to generate enough of a performance difference to make the effort and potential tax cost worthwhile. The approach does not work with all assets. Testing is required to see if it worked in the past. It is possible to operate this approach by visual inspection of charts, but for more precision and to avoid seeing what you may want to see, using quantitative data is preferable. You would need to find the performance evaluation period (e.g. the number of days, weeks, months quarters, years) that produces the best combination of high return and low maximum drawdown, based on long-term history, and the best frequency of decision making (e.g. daily, weekly, monthly quarterly or longer). The “best fit” evaluation period and decision frequency will probably drift over time, so it needs to be regularly evaluated for adjustment. The information that follows gets a bit into the weeds of the approach. If the investor wishes to use options (for example, covered Calls) on the S&P 500 position, then SPY would be needed because it has the options and liquidity that would be suitable. There are other ETFs from other sponsors that could just as well be used instead of the Vanguard ETFs in a forward practice. First, Portfolio Visualizer is among the sites that provide good tools for experimenting with the approach, and it is free. There are subscription sites that have a number of pre-built models that can be followed as well. The data that follows is entirely from Portfolio Visualizer. The tables above and below illustrate how the evaluation period and frequency might be regularly reviewed for possible adjustment, and provide evidence of the efficacy of the approaches from 1997 to 2018 YTD, as well as return, maximum drawdown and several other important metrics for the results for method and their benchmarks. 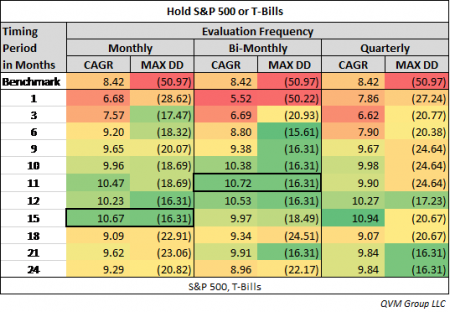 The illustrative cases are for the S&P 500 as a single risk asset versus T-Bills (above); and the best 2 of 5 risk assets versus T-Bills (below). The charts and tables that follow are for S&P 500 versus T-Bills, and for selecting the best 2 of 5 assets (S&P 500, DM stocks, EM stocks, US REITs, and Intermediate-term Treasuries) versus T-Bills. In each case, the backtest period was about 42 years (1997-2018 YTD). 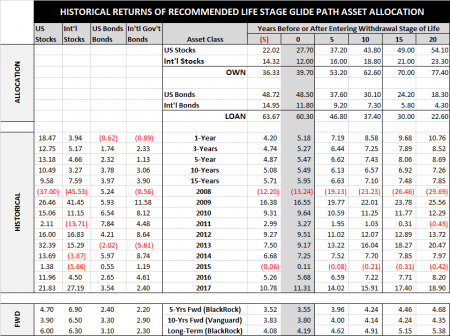 In the best 2 of 5, the result could be 2 risk assets, 1 risk asset and T-Bills, or all T-Bills. 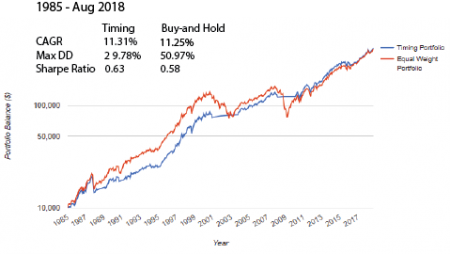 The timing model produced a 19.67% return over the period 1997-August 2018 versus 8.42% for the equal weight portfolio, which in this case is 100% S&P 500. Note that these results are based on investable assets, not indexes. 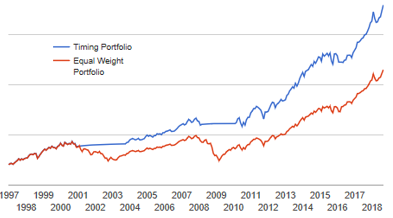 While results such as this could have been available to you if you did this on your own, they would not have been effective for a “hedge” fund type investment with their 2% management fees and 20% of gains above a preferred return, because the return difference of 2.22% would have been wiped out by their fees. The volatility (standard deviation) of the method was lower than buy-and-hold. The best year was better, and the worst year was dramatically better (negative 7.67% versus negative 37.02%). The superior maximum drawdown was critical (down 16.31% versus down 50.97% for buy-and-hold). The average trade lasted 29.9 months, which tended to create capital gains as opposed to ordinary income when trades were executed. The Sharpe Ratio (return in excess of T-Bill return, divided by the standard deviation of return – how “bumpy” the ride was) was better for the method (0.79 versus 0.48), as was the Sortino Ratio (like the Sharpe Ratio but only divided by the size of downside volatility) at 1.29 versus 0.70. However, not all backtests are inspiring. The specific time period you test and whether or not a Bear intervened are critical to how attractive the method appears. It can be years of effort with little if any outperformance to show (and taxes in regular accounts) if a Bear is not in the period. It takes a Bear to make relative momentum versus T-Bills look good. As with the single risk asset (S&P 500) versus T-Bills, the best 2 of 5 risk assets was superior (excluding any tax considerations) to the equal weight, buy-and-hold approach. Compound return was better by 4.73%. Standard deviation was almost the same. The best year was better by 16.73%. The worst year was better by 13.68%. The maximum drawdown was better (less severe) by 26.15%. The Sharpe Ratio was higher by 0.37. The Sortino Ratio was better by 0.79. The correlation to total US stocks was lower by 0.30, and the Beta to total US stocks was lower by 0.22. All good. 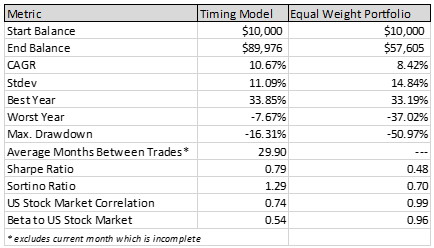 There were many trades for an average trade holding time of 2.37 months. That created a lot of ordinary income for someone doing this in a regular taxable account. 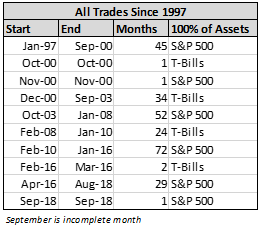 The trades over the past year are in this table. Selecting the best 2 of 5 risk assets might be expected to be more effective during periods without a Bear market, but the evidence in our test suggests that is not the case. Looking at the period 2010 through August 2018 (a period without a Bear), we were able to find an evaluation period that produced a 2+% higher return (before any tax costs), but it produced a 1+% more severe maximum drawdown — it did not provide the downside protection the method is intended to provide. The most useful evaluation period we found for the best 2 of 5 model was 12 months. It produced a 9.56% return versus 7.49% for the equal weighted benchmark, but experienced a 16.69% maximum drawdown versus 15.50% for the benchmark. The following charts show the results for evaluation periods of 1, 11 and 12 months. 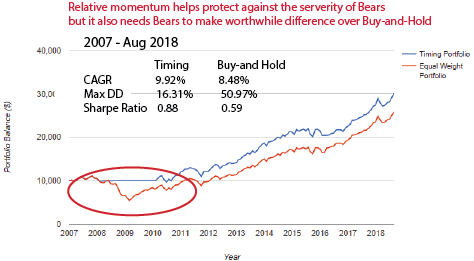 Because we consider maximum drawdown protection key to the utility of relative momentum versus T-Bills, our conclusion is that the method needs a Bear market to be attractive. Relative momentum allocation between a risk asset and T-Bills can produce meaningfully higher return and substantially less severe maximum drawdowns, but the fact is that the avoidance of large drawdowns (Bear markets) is the most important contributor to the potential of the method to outperform. If there is no Bear market during the time the method is used, the potential for outperformance is limited. Tax costs are a problem in taxable accounts (more when selecting among multiple risk assets, because position holding time is shorter with more ordinary income tax cost). No universal evaluation period is effective for all risk assets, and the evaluation periods that work best drift over time, making continuous curve fitting part of the challenge and work load. Not all assets have good potential with the method (basically only those that have occasional major drawdowns appear to work well). 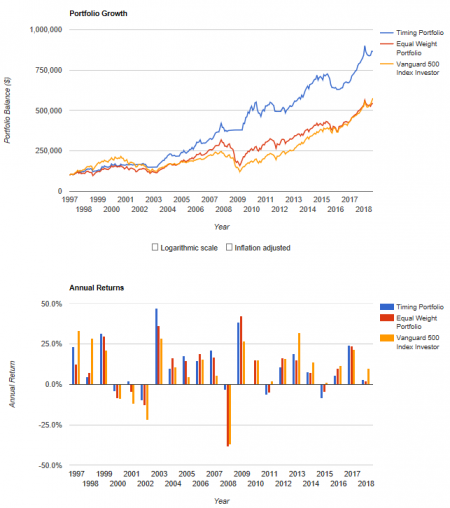 Because of the role of Bear markets in creating advantage for the method, it is important when reviewing reports about the method to distinguish between long-term studies incorporating one or more Bears, and short-term studies of Bull markets. Winning by not losing is the most important benefit of the method. The benefit derived is greatest when the loss experienced by buy-and-hold is greatest. As must always be said, past performance is no guarantee of future performance. I hope that for those of you who have been asking about the popular idea of risk reduction with relative momentum versus T-Bills, that this is helpful. &amp;lt;div style=”position:fixed; top:0; left:0;”&amp;gt;&amp;lt;img alt=”” height=”0″ src=”/xgCxM9By/xhr/api/v1/collector/noScript.gif?appId=PXxgCxM9By” width=”0″ /&amp;gt;&amp;lt;/div&amp;gt;? 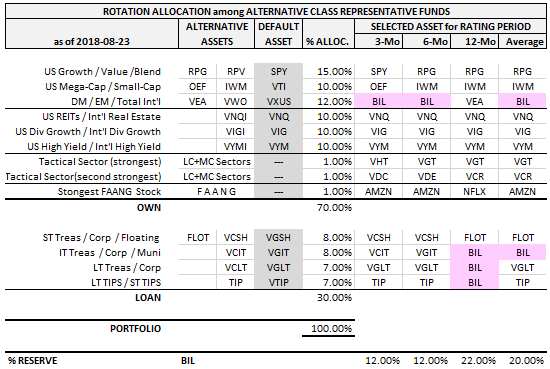 One approach to a simple rules-based, mechanical system to manage opportunity and potentially minimize maximum drawdown in Bear markets is to use relative momentum between each strategic asset and a risk-free asset (T-Bills) as an alternative — all-in or all-out of each strategic asset based on its return versus the return of T-Bills.Bear market. The shorter the evaluation period, the smaller the maximum drawdown exposure — but the greater the trade frequency which is not tax efficient in a regular taxable account, and the more frequent the whipsaw (sort of a head-fake by the market requiring reversal of the position with positive loss or opportunity cost). The longer the evaluation period, the larger the maximum drawdown exposure — but the lower the trade frequency, which is more tax efficient in regular taxable account, and the less frequent and potentially less costly the whipsaw. Ways to attempt the avoid the worst of each evaluation period length while attempting to capture some of the best of the each evaluation period may be to use an average of shorter and longer periods, or to step into and out of strategic positions in phases by using more than one evaluation period length. Let’s look at an example, using the Swensen Reference Portolio as a base case with 2018-08-23 data. Swensen is the CIO of the Yale Endowment, who proposed his “Reference Portfolio” as something from which to depart for a personally suitable portfolio in his book, “Unconventional Successs: a Fundamental Approach to Personal Investment”. He did not recommend momentum rotation in that book. The Swensen portfolio is 70% OWN, 30% LOAN and 0% RESERVE. This table shows the Swensen portolio as the default allocation, and to the right of that are four alternative allocations based on whether the strategic risk asset has outperformed risk-free cash over a 3, 6, or 12 months rating period, or the average of those periods. Where the risk asset did not outperform, cash is held in lieu of the asset. Pink shaded cells indicate that the strategic risk asset is not held and instead the money for that slot is held in Reserve in risk-free T-Bills. 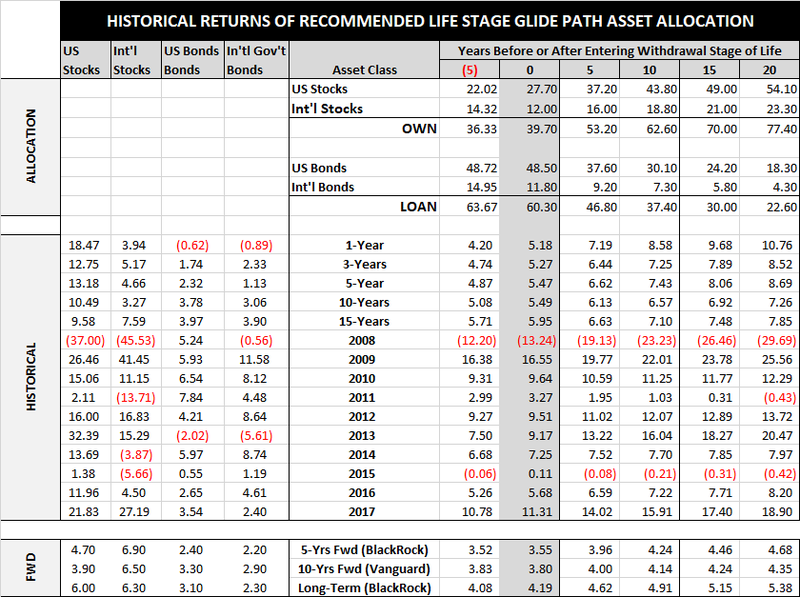 The tables on the left show the total return of each asset over each evaluation period and the excess return. The excess return is the total return minus the return of the risk-free asset (T-Bills) for the same period. For equities (OWN), the relative momentum method suggests not owning the emerging markets fund at this time, and only owning the non-US developed markets fund if using the 12-month evaluation period. Total US stocks and US REITs have positive excess return for all periods and would be held at the full strategic allocation level. For debt (LOAN), the relative momentum method suggests intermediate-term Treasuries should not be owned if using the 12-month evaluation period. Short-term TIPS are OK for all the periods. 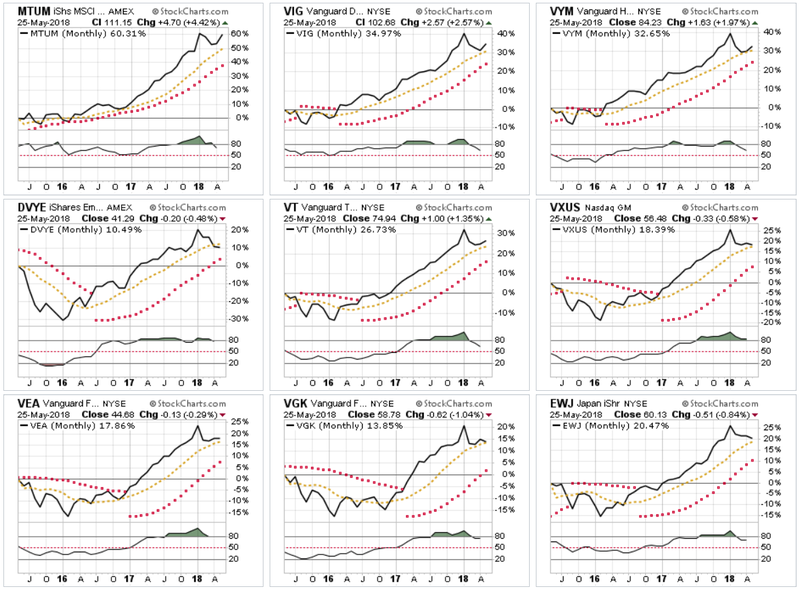 You can operate portfolios, with any chosen set of risk assets using relative momentum as illustrated here. Such portfolios can be rebalanced at intervals ranging from monthly, quarterly, semi-annually to annually. The longer rating periods may lag too much, and the shorter periods may be prone to whipsaw losses or opportunity cost. The method is intended to capture the bulk of major up trends and to avoid the bulk of major down trends. This is not a panacea approach, and may or may not improve returns, but probably can limit maximum drawdowns associated with Bear markets without relying on the variable quality of judgement (assuming as is typically the case that market tops are a process of rolling over; not a steep, sudden drop). Let’s say, you were using a staged in-and-out approach to each strategic asset based on three steps governed by the 3-month, 6-month and 12-month relative returns. CASH would be 20% (residual not in strategic assets). This simple relative momentum investing does not include consideration of the fundamental condition, fundamental prospects for or valuation of the assets used and being rotated. That is a key weakness and risk factor associated with this approach unless the assets are pre-selected based on fundamentals and/or valuation. Presumably, the strategic assets and their allocation weights would have been chosen for a good long-term fundamental, non-technical reasons. This method is meant merely to modulate exposure to each strategic asset based on performance relative to a risk-free asset (T-Bills). The approach can become progressively more complex and granular. For example, a portfolio may have a tactical sleeve that involves less diversified assets, that may be higher opportunity/risk or that are expected to exhibit particularly favorable momentum over shorter periods of time. Such a sleeve might be for the top momentum sector funds, or top country funds, or top ETFs of any type, or top momentum individual stocks, or the top security from a custom list. 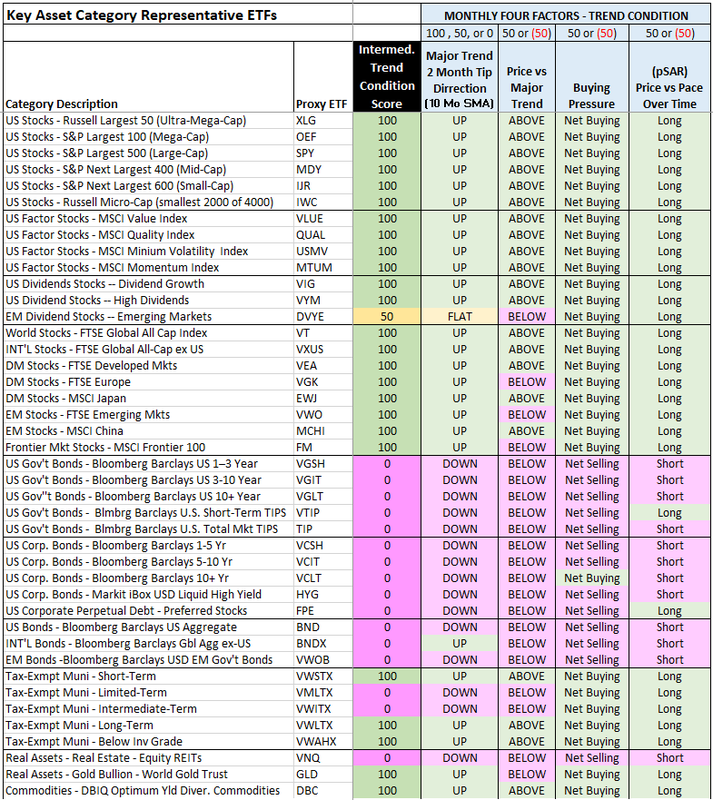 In the example below, we created a tactical sleeve that would invest in the top 2 momentum sectors among the 10 Vanguard US large-cap/mid-cap sector funds, and also invest in the top momentum stock among the 5 FAANG stocks [Facebook (FB), Amazon (AMZN), Apple (AAPL), Netflix (NLFX), Google (GOOG)]. default short-term TIPS (VTIP), alternative long-term TIPS (TIP). Note: This is not a recommendation for a portfolio, merely an illustration of how complexity can be increased. It is probably obvious that as the number of portfolio slots increases, and the number of securities considered for each slot increases, the decision process moves from one of paper and pencil to one requiring a database return download source and some coding in an Excel spreadsheet – unless you want to drive yourself a little bit crazy. 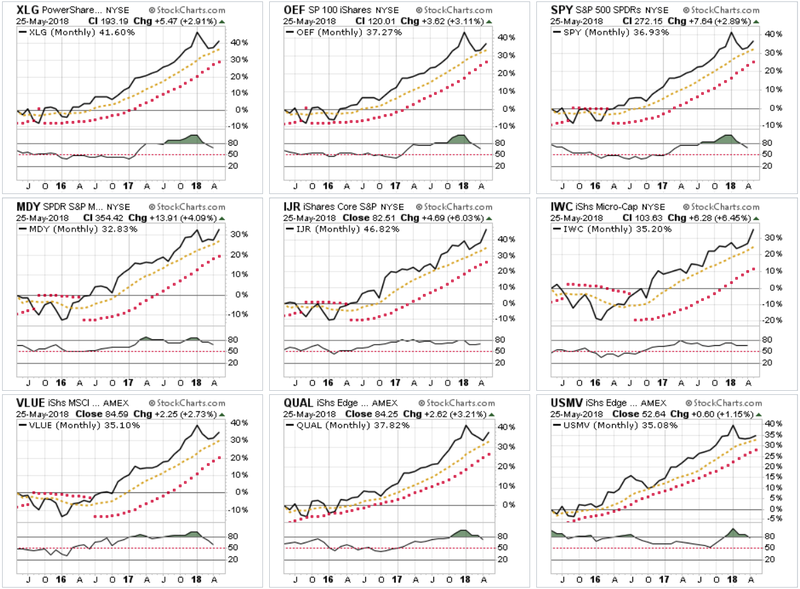 During this long Bull market, some portfolios have been more aggressive than might be expected over the long-term. Now, we are approaching or may be in the 9th inning or the 11th hour, and are exposed to some extraordinary event risks. It may be appropriate to review what the consensus Life Stage allocation is according to major money management institutions. By Life Stage, we mean, not age, but how many years before you convert from adding assets to your portfolio to withdrawing assets – the Withdrawal Stage of Life. 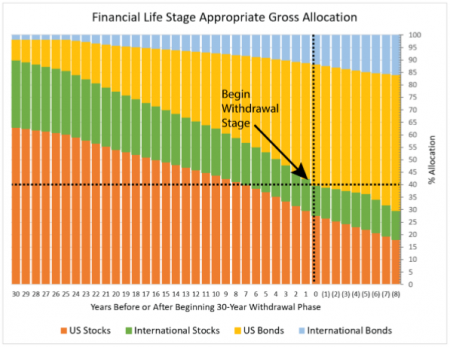 While people can enter the Withdrawal Stage at any age, the standard reference model is at age 65 with an estimated 30 years to live (for the portfolio to last). Based on that assumption, institutions have designed what they believe are the most sensible and prudent allocations leading up to and following the commencement of the Withdrawal Stage. You may wonder how those allocation levels have performed historically. 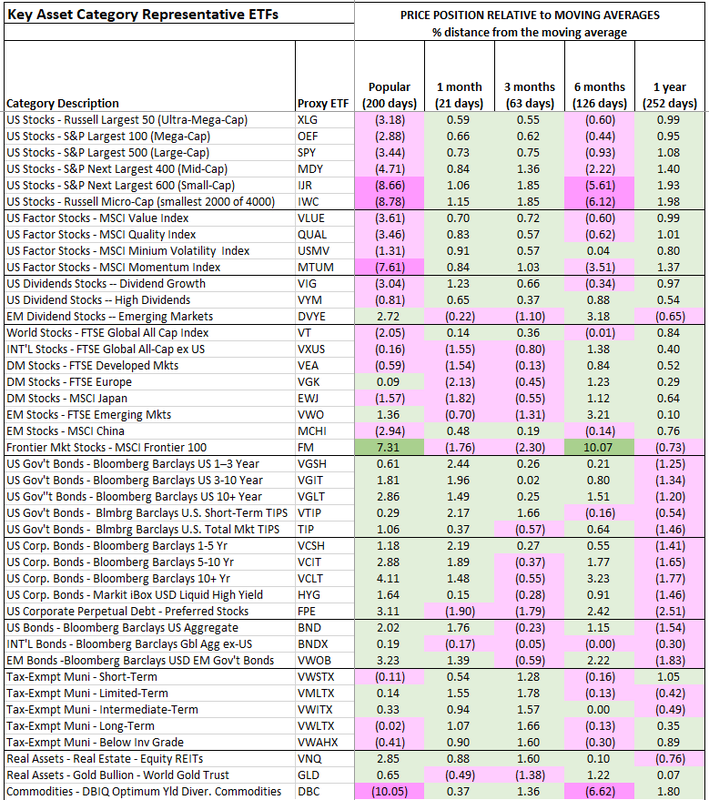 This table shows recommended allocations at 5-year intervals before and after entering the Withdrawal Stage, and how they performed over various cumulative periods through July 2018, and over individual calendar years through 2017, plus forecasts by Vanguard and BlackRock. 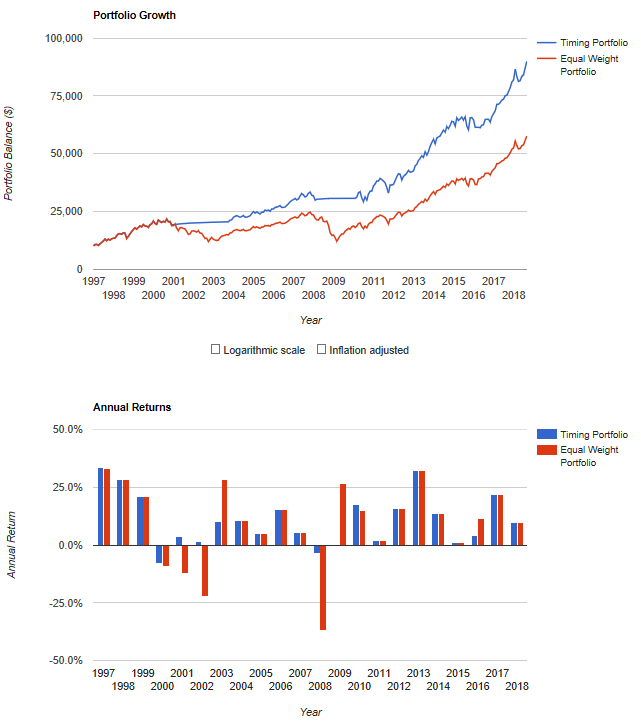 The data is for indexes, except for international Dollar hedged government bonds which is based on the Vanguard fund with that objective from 2014-2017, and the VALIC foreign government bonds fund (Dollar hedged opportunistically) from 2008-2013. Even though the stock market may continue on longer than expected, we think those near or in the Withdrawal Stage should give careful consideration to these “rule of thumb” allocation levels; judge strategic aggressiveness relative to them; and if more aggressive, shift tactically toward them. We’d like to be more safe than sorry over the next couple of years. As we have discussed before, we are using ultra-short-term, investment grade, floating rate US bonds in lieu of other bonds during this Fed rate hiking cycle; probably until early 2019 (maybe longer for the international bonds portion). New Communications Services sector 49% Facebook, Alphabet and Netflix. Consumer Discretionary and Information Technology provide key stocks to new sector. 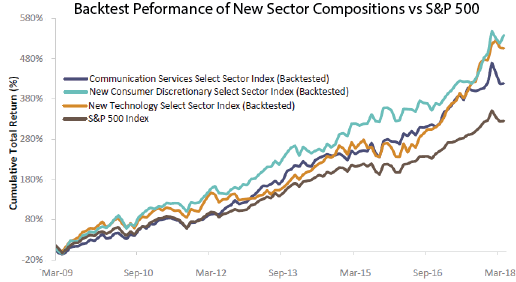 Communications Services has lower PEG ratio than Consumer Discretionary and Information Technology which provided most of it constituents. Next month the Global Industrial Classification System (GICS) will launch a new sector: Communications Services. That sector will include the stocks formerly of the Telecom Sector (notably Verizon and AT&T), but also numerous stocks pulled out of the Information Technology and Consumer Discretionary sectors. These changes modify the relative appeal of the Info Tech and Consumer Discretionary sectors. 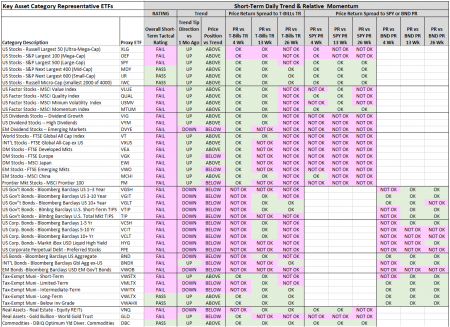 This table shows how the top stocks in the new sector (represented by XLC, a new ETF with a head start on the new sector) come from sister sectors Info Tech (XLK) and Consumer Discretionary (XLY). Those are some big names leaving both XLK and XLY, going into XLC. 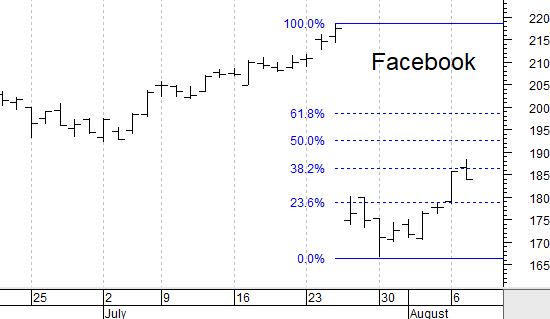 Lots of movement among the so-called FAANG stocks (Facebook, Amazon, Apple, Netflix and Google [now Alphabet]). Facebook, Alphabet, and Netflix will compose 49% of the new sector. Apple remains in Info Tech (XLK) and Amazon remains in Consumer Discretionary (XLY). We will have to rely on simulated histories going forward to compare each of these three sectors to their historical attributes. 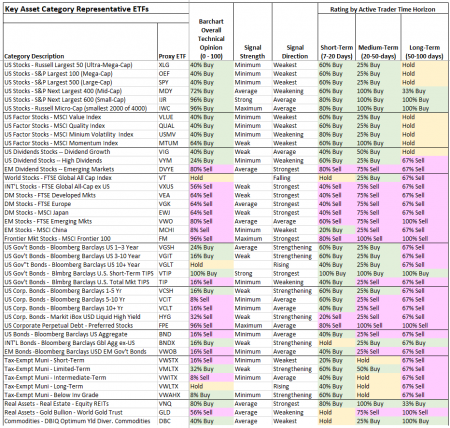 One such study provided by the sponsor of these ETFs shows Info Tech and Consumer Discretionary becoming more expensive relative to their simulated 15-year histories; and Communications Services less expensive than its history than the other two. The PEG ratios (P/E over 3-5 yr forecasted earnings growth) is most attractive for Communication Services at 1.1, versus 2.0 for new Info Tech and 1.5 for new Consumer Discretionary. This is the full list of members of the new sector along with their weights. Very recently Communications Services underperformed the other two simulations, because it holds FaceBook, which took a steep dive in late July from which it has not yet recovered. A backtested plot by Bloomberg of the returns of the new and two recomposed sectors shows each of the three simulations outperformed the S&P 500 since the market bottom in 2009 through April 30, 2018. This ETF has one of the fastest adoption rates. Even though the sector is not yet official, XLC has raised $368 million in just 2 months of existence. Expense ratio 13 basis points. 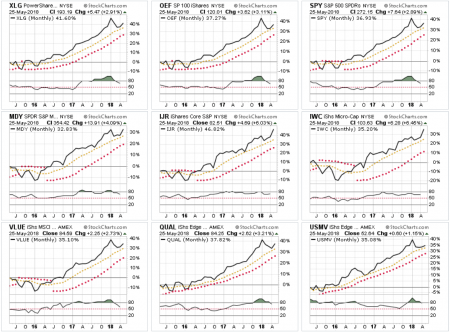 Intermediate trend indication for 45 key asset categories. S&P 1500 Net Buying Pressure. 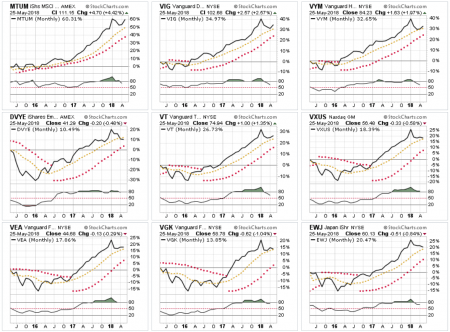 Compare relative performance (momentum) of sectors, regions, countries, mkt-cap, styles, factors. 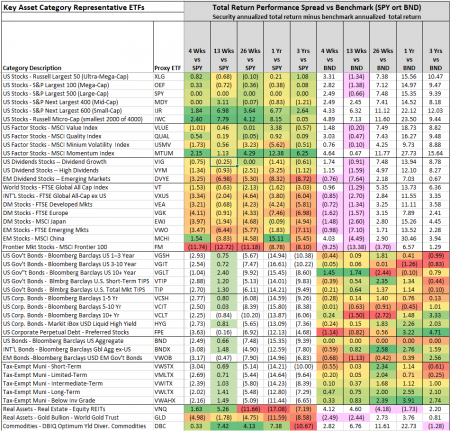 Identify leading relative performance stocks and ETFs. This week I’m sharing with you a chart book that I put together for myself periodically to attempt a wide-angle view of markets. You may find bits of it here and there interesting, or the basis of questions you would like to discuss. The chart book contains chart and table data only and is color-coded in most places to be data visualization friendly as you scroll through the pages. You can download the chart book here. Important Note: This ChartBook focuses on relative performance and chart patterns, and does not consider thematic issues, forward earnings or revenue forecasts, valuation or company fundamentals or credit rating. Those are important factors that should be evaluated before any of the securities identified in this ChartBook are purchased. Relative performance is not a substitution for strategic allocation, and may not be a suitable subject matter for many investors. It may be useful to those with tactical ranges within their strategic allocation, or those seeking to make security substitutions within their allocation based on relative performance, or those operating a short-term tactical sleeve within their portfolio. Do additional research on any security listed here before purchase. These are not recommendations. They are filtered observations of performance over the past 12, 6, 3 and 1 months. This is an investment decision aid, not an investment decision solution. Based on relative price performance to the S&P 500, this ChartBook identifies none of the top 10 developed markets countries and none of the top 10 emerging market countries, nor the world, total international, Europe, emerging markets or frontier markets as outperforming. 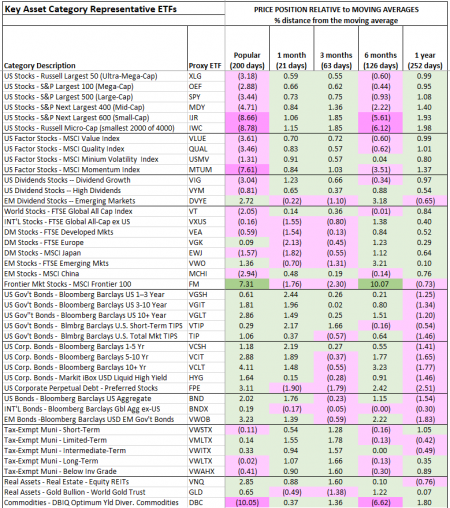 A panoramic data document like this ChartBook is intended to not only give a wide perspective on the markets, but also to help unusual or abnormal data to stand out. Scroll through the pages to see what may be of interest to you. To give you a starting point of reference on many of the pages here are some comments by page number. The comments are not complete, They may help you get into the data on each page . Page 2 – Yield Curve: the yield spread between short-term rates and intermediate-term rates is compressing rapidly but still positive; and in the past when shorter-term rates become larger than longer-term rates it has signaled a coming recession and the decline in stock prices. We aren’t there yet, but this is a risk factor to be closely watched. 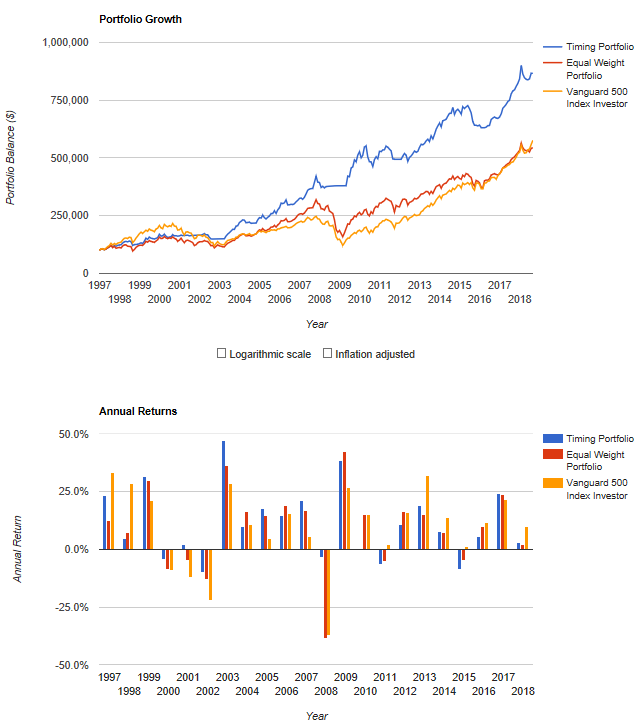 Page 4 – PEG ratios (price earnings ratio divided by five year forecasted earnings growth rate) appear to be most attractive for Consumer Cyclicals among large-cap, mid-cap and small-cap US stocks; and you will see on page 19 that they show favorable momentum as well; but on page 5 they look a bit expensive versus historical valuations. Page 5 – telecommunications services looks inexpensive, but in September that sector will be redefined as Communication Services and will include some stocks from Consumer Discretionary and from Information Technology, so those numbers really aren’t useful now. If we’re lucky analysts will restate history based upon the reconfigured sectors sometime later this year. Page 6 -US stocks are in good trend condition as are international stocks overall, but Europe is wavering and emerging markets are down (as are real estate and gold). Even though the China ETF MCHI is still in an intermediate uptrend, you will see later on page 14 that the overall China market is doing poorly, and the larger-cap stocks represented by the ETF have broken down on a daily chart basis. 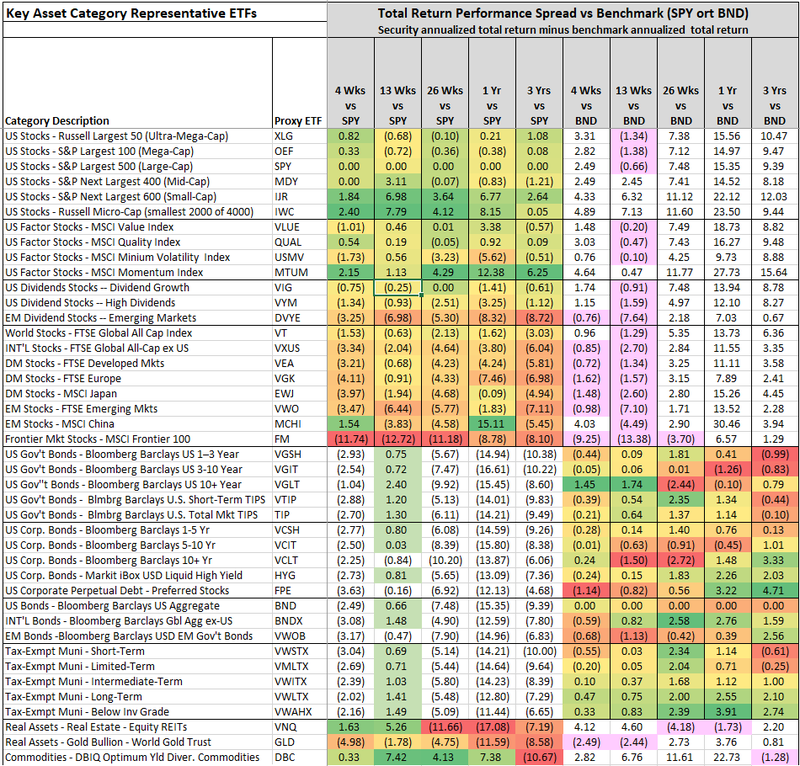 Page 7 -shows fundamental data for key equity categories revealing more attractive price to cash flow multiples for foreign stocks versus domestic stocks as well as higher yields: and it shows better Sharpe Ratios (basically return divided by volatility) for minimum volatility and momentum factor funds, and attractive ROE levels for quality minimum volatility and momentum factor funds. 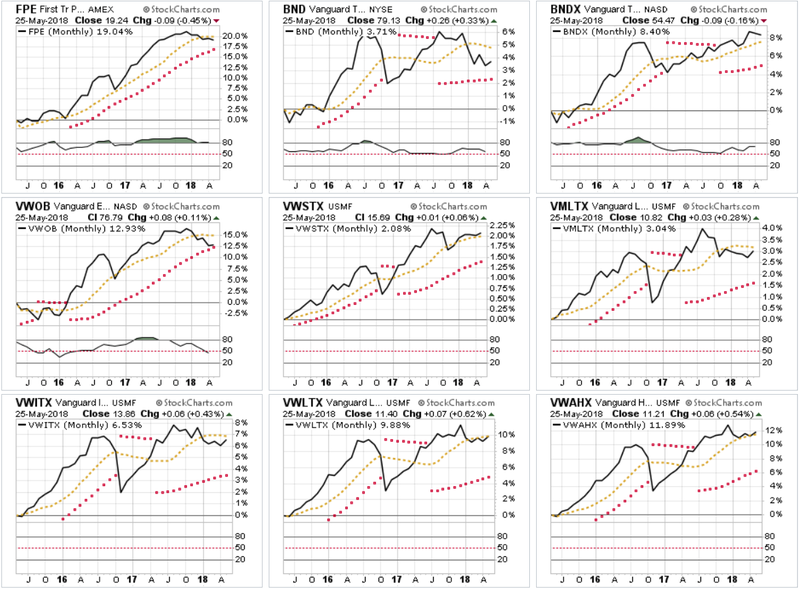 Page 8 – taxable bonds are all in downtrends and some municipal bonds are not trending upward or are wavering. Page 9 – Some bond categories show extraordinary interest rate risk as evidenced by the duration being substantially larger than the yield. As a rule of thumb, if the interest rate on the fund rises by 1% over a short period of time, the price will decline by the duration times the change in interest rate. Long-term government bonds are less than 3% and have more than 17 years of duration – dangerous. Long-term corporate’s pay less than 5% and have almost 14 years of duration – also dangerous in this time of rising Federal Reserve rates, rising GDP, and rising inflation. 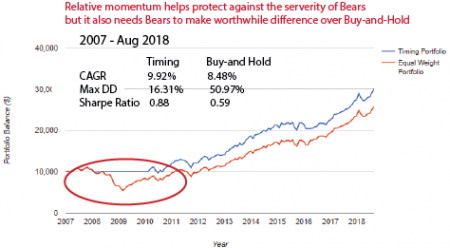 Page 10 – S&P 1500 Buying and Selling pressure: net buying pressure began to decrease in the beginning of 2017 and has become flat to negative this year. It is a divergence from the rise in stock prices during that time. This is a cautionary sign. The indicator measures the total amount of money flowing through rising stocks divided by the total amount of money flowing through all stocks. Page 11 – the percentage of stocks in Correction, Bear or Severe Bear have been in rough synchrony with price movements of the Standard & Poor’s 1500 stocks since 2017, and no particular signal is generated there. Page 12 – the percentage of stocks within 2% of their high is in a normal range and is acting in synchrony with stock prices. There is no signal there. Page 13 – the percentage of stocks above their 200-day moving average is at a healthy level, continuing to support rising stock prices. Page 14 – breath is best in the USA, second-best at okay levels in Europe. Japan is in a week third place. Larger China market is doing badly with the median stock off more than 30% from its high, and 90% in a Correction and 75% in a Bear or worse. The chart below the table, however, shows the effect of what is called “sequence risk”. Someone who invested in China a year ago is doing okay, but someone who invested at the beginning of this year is doing very badly. The intermediate trend for China shown on page 6 is still positive, but a detailed review of the chart shows that it is near a turning point, and this daily chart on page 14 reveals that breakdown more clearly. Page 17 – looking at bonds only T-Bills and ultra-short-term investment grade floating rate bonds show price behavior that is positive. 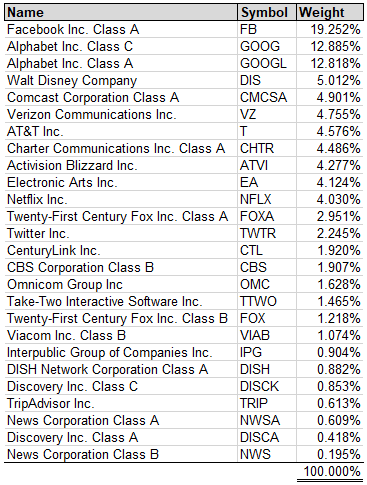 Note these are price returns , not total returns. The total return on US investment grade ultra-short-term floating rate bonds is higher than for T-bills. We have effectively shifted virtually all of our bond allocation to ultra-short-term investment grade floating rate bonds some time ago, and expect to remain there through the Fed rate hike cycle. You can see the steady positive return of ultra-short-term investment grade floating rate bonds relative to the aggregate bond index in the middle chart in the top line of page 18. 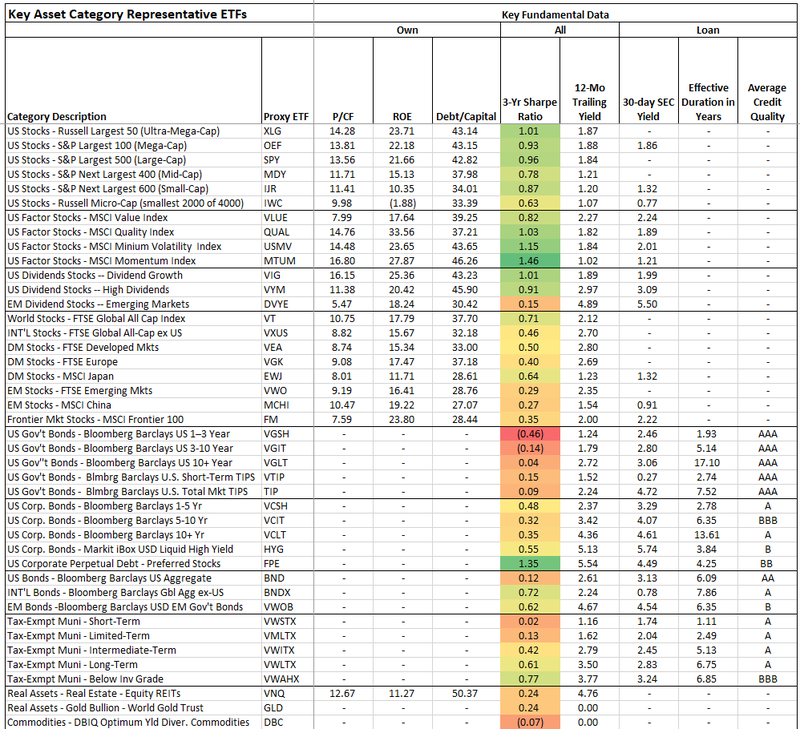 Page 19 – among US sectors Technology has the strongest price momentum, even though the last week was tough for some. 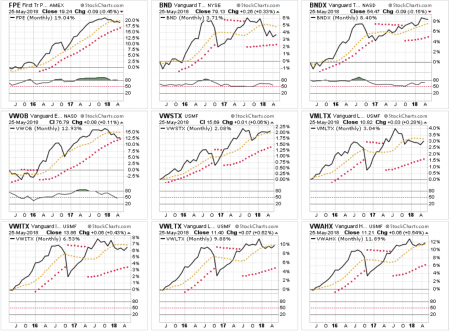 Consumer Discretionary sectors also have good momentum. Page 21 – none of the top 10 Developed market countries or top 10 Emerging market countries have favorable price momentum. 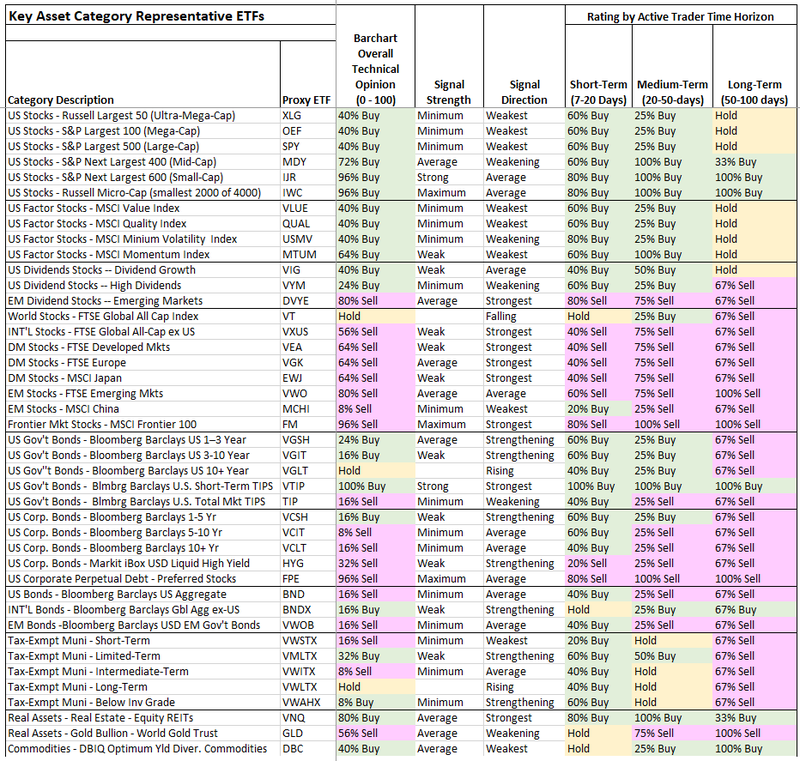 Page 23 – there are some ETF’s with favorable price momentum. They are primarily found in the Technology and Healthcare sectors. Page 27 – within the Russell 3000 (essentially the entire US market of stocks of consequence) there are 100 or so stocks with good momentum that also have good Quality and Value characteristics. This page shows those with the largest 12 month price gains, and the following page 28 shows those that gained at least 200% over three years and have the best shape curves among those with favorable momentum. Page 29 – looking at the 150+ stocks selected by Northern trust as “quality” dividend stocks, a limited number have favorable price momentum, and page 30 shows those 12 with the best shaped three-year curves among them.